This post is hard to write. It's a little more personal that I've done lately. I don't normally talk about these types of issues publicly. Because a lot of people will not agree with me and I don't like to rock the boat. Today instead of books I'm talking about addicts and the struggles they face as well as the fallout of their actions. 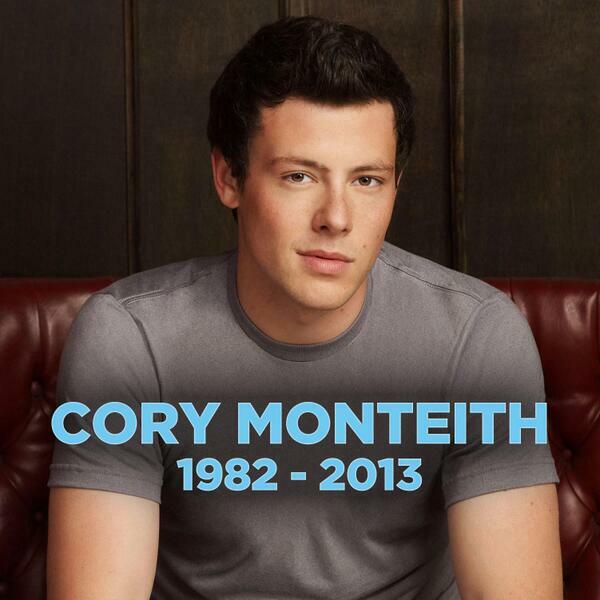 I woke up this morning to the news that Cory Monteith from Glee had passed away last night. They haven't stated a cause of death, but I'm going to go out on a limb here and guess that since he had substance abuse problems there's a 95% chance that it was drug related. Quite possibly an OD. As many of you know I am a huge Glee fan and this absolutely breaks my Gleek heart. But now I'm thinking of those he left behind - his family, Lea, and all of his friends and fans. They are left to mourn the loss of someone who has died way too young. Lots of people are going to belittle him and state that this is what he gets for being a drug addict. Those people have never had to face an addiction. Maybe they've never had family or friends that had problems. I don't know. They are going to judge. I'm sad. Not just because one of my favorite actors has died. I'm sad because up until the moment of his last breath...he was fighting demons. Demons that were inside him. He was a troubled person. People start using drugs for various reason; some to hide from things, others for pain relief, and then there are some because they just didn't know better. I don't know what his reasons were but he had an addiction. From what I understand he had been fighting this since he was a teen. I'm also mad. I'm mad that he left people behind that loved him. I'm mad that he couldn't overcome his problems. I'm mad that we as a society let him down. Yes, I said it. Society has let him down. We listen to songs, watch movies and see all the stars walking around high and they make drug use look "cool". They make a joke out of it. Abusing drugs is not cool. It is not a joke. It's not going to make you happy and it's not going to fix your problems. We know that there are people that face this on a daily basis. They wake up in the morning and the first thing they think of is how or where they can get their next fix. For celebrities, it is so much easier, they have the resources readily available. They have the money. For an everyday person to support their habit they will resort to stealing if needed. There are so many things that an addict will resort to to feed their habit. And in the end they can lose everything important. If you've ever known someone with a problem you know the struggles they face. You watch them battle their addiction, maybe stay clean for awhile and then fall off the wagon. "How could they do that? ", you wonder. We'll probably never fully understand why or how they could do it to themselves. But the biggest thing I beg of you...never give up on them. There are so many resources out there...if one doesn't work try another and another and another. But NEVER give up. Continue to fight for the person you love. When you look at them and see a strung out person, I look at them and see a husband, a father, a brother, a son... Someone who is deserving of love and understanding. Now I'm not saying you are going to save them. Sometimes that isn't possible. I'm sure Cory's family is going to look back at everything that has gone on and wonder what they could have done differently. They'll most likely feel guilty thinking it wasn't enough. Sadly, that is the cross they have to bear now. I pray they find peace in this situation. But whatever you do, do it with love, understanding, and dignity. Instead of beating someone down who already has issues and is hurting. And yes, they are hurting. Let's give them hope and love and support. It's easy to look the other way but it can be worth it to fight for them.